It's my yearly tradition to watch PBA's opening ceremonies because I root for Brgy. Ginebra Kings and as a loyal alumni, I look forward to seeing generations of UST king tigers! Since there are only 10 teams on this pro league, every year is a "survival of the fittest". With the rise of Air21 DLSU Green Archers and Brgy Ginebra Blue Eagles (..not the official team names but yeah), I was surprised to know that there are only 6 Thomasians on the active players list. Traditionally speaking, king Tigers are often drafted by Barako Bull/Redbull before they get traded to another team. Don't ask me why. There was a full conference in 2011, when both Barako rookies Dylan Ababou and Allein Maliksi, played very well and were tagged as "Espanya Express". Fast forward to this season, they found themselves as rivals on Manila Classico. The debut game of the 1st overall pick, Greg Slaughter, was overshadowed by Dylan Ababou's version of #theReturn. He proved that he fully recovered from torn ACL injury by scoring 16 points in 17 minutes on the crucial second half of Manila Classico. Its a great reminder of the potentials of the 2009 UAAP MVP, especially that he was almost traded during the off season. Welcome back, Dylan! Meanwhile, Allein Maliksi's rise as an SMC Mixer was halted by an injury but he's no stranger to that and he'll surely bounce back! The second game on the season's opening day, featured Alaska Aces and Rain Or Shine. Although in a losing effort, Alaska's quiet superstar, Cyrus Baguio, led in scoring. 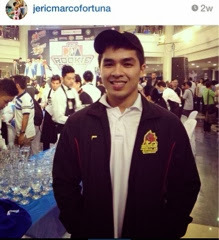 Baguio was also drafted by Barako Bull and played in several teams before finally finding a home in Alaska Aces. Why quiet superstar? Well, he's been in the league for 10 years now, 8x PBA All Star, served in the national and a member of last season's second mythical team but without much fanfare. Quiet but efficient, indeed. 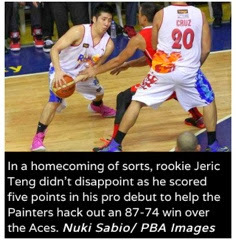 I just caught Jeric Teng's debut game on YouTube and its reassuring that ROS' Coach Yeng has given him good minutes, for a rookie. I feel that there's a lot of disappointments for Teng this year, UST settling to another runner up finish on his last playing year and ending up as a second round pick on the PBA rookie draft. He says that its fine with him, ok, I'll believe him. 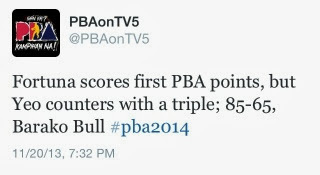 I hope that it will trigger him to work harder because he certainly deserves to play in the PBA! I'm just worried because the guard position in RainOrShine is loaded BUT his current coach is well known for bringing out the best in his players! Jervy Cruz, still the cute monster! Surprise! The best player of the second game is another former king Tiger! 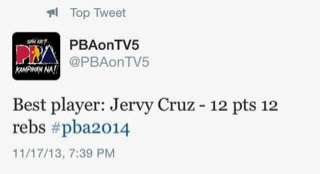 I'm happy to see that Jervy Cruz, 2007 UAAP MVP my daddy's gym buddy, continues to be a dominant big man for ROS and in the PBA. He just won the "Most Improved Player" award last season. He may not be the biggest in terms of height but he is very skilled mautak. My only question now is, where is 2006 UAAP Finals MVP, Jojo Duncil? Update: Duncil is on Petron's bench. 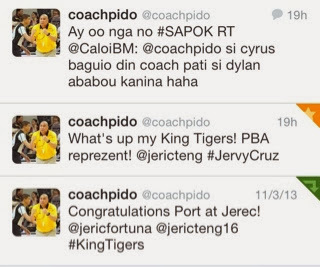 I hope to see Mariano, Ferrer and other UST King Tigers playing in the PBA soon! !